A shepherd’s pie is supposed to be filled with lamb, which makes sense, but we’re working on a freezer full of meat Nick hunted and for probably legal reasons, he didn’t hunt a single sheep. 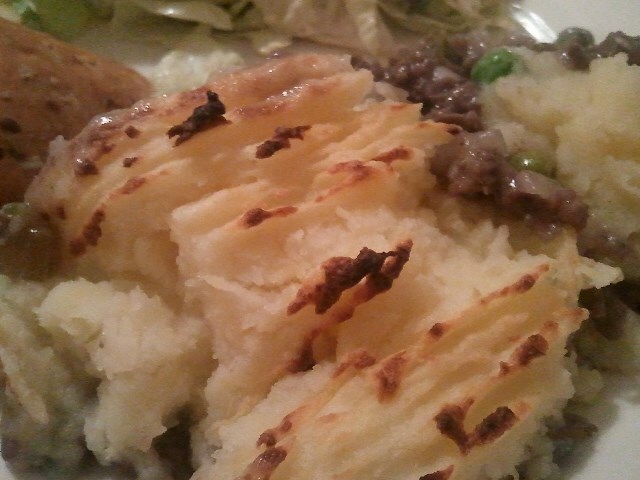 So, let’s call this cottage pie, because I think that’s what you call a dish of meat topped with potatoes when the meat isn’t lamb. Here it’s filled with moose or venison, depending on what’s at the top of the pile in the deep freeze. We are eating a lot of comfort food these days, as the weather has called for it and our lungs and noses have suggested it might be time for cold season and there are Christmas trees in store windows now. I don’t know where most of my days go, but the seasons are short and the years are passing so much more quickly than they used to. So occasionally, on evening I don’t have any plans, I’ll invite a friend or two over, and we’ll share a semi-responsible bit of wine and listen to whatever playlist I’m currently obsessing over and eat big plates of something hearty. Comfort food for comfortable evenings. The stuff elastic waistbands were invented for. Pro tip: If you measure out the wine before you start cooking, you will be sure to have enough for both you and the recipe. Also, I cannot emphasize enough how much you need a food mill. Ask for one for Christmas! 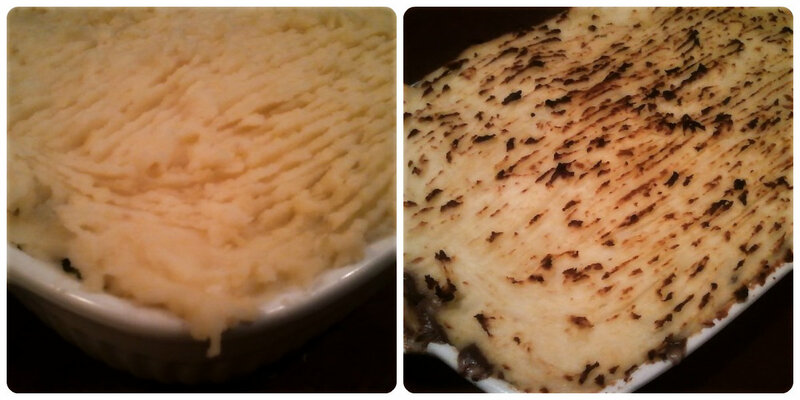 It is the best tool for perfectly fluffy, lump-free mashed potatoes; I used one for the potato and rutabaga topping and there was nary a lump to be found in my mash. They also stir and spread more nicely if they’ve been milled. I am not tall enough to food-mill on my counter, so I sit on the floor to do it. Preheat your oven to 375°. Lightly grease a 9″x13″ baking dish. 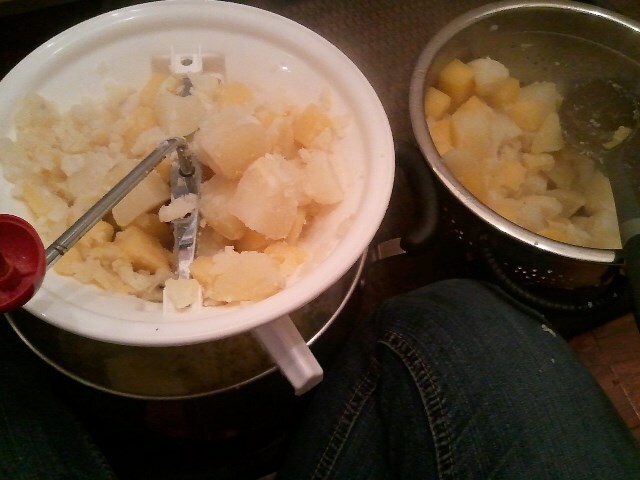 Put cubed potatoes and rutabaga into a large pot of salted water and bring it to a boil over high heat. Once it’s boiling, drop the heat to medium-high and continue to cook. Meanwhile, heat olive oil in a large pan over medium-high heat. Add onion, celery and carrots, and cook for two to three minutes, until the veggies have brightened in colour. Add garlic, cook another minute, then add your meat, breaking it into pieces with your hands as you drop it into the pan. Stir, cooking until meat has browned. Add rosemary, Worcestershire sauce, mustard, and pepper. Stir. Add flour, and stir again until all the white disappears into the mix. Add wine, scraping the bottom of the pan with your spoon, and cook another minute or two. Add stock, and simmer until the sauce has thickened and reduced just slightly. Taste, adjusting seasonings as needed. 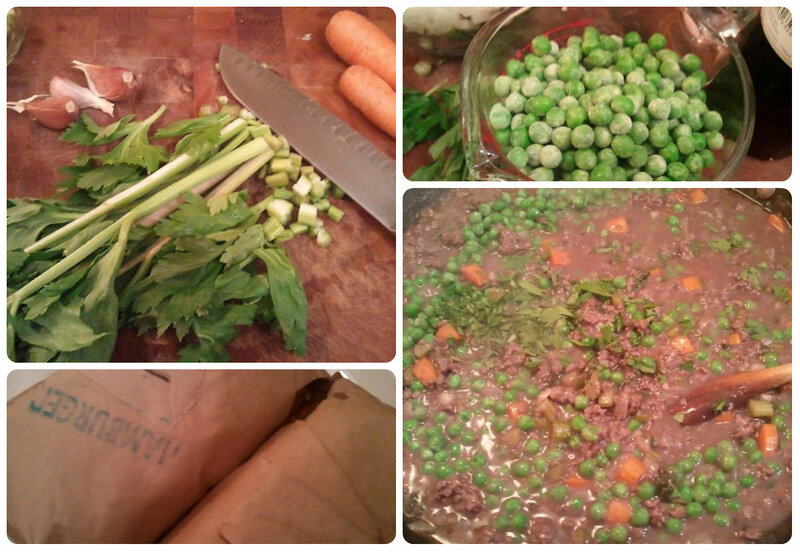 Add peas and parsley. Stir. Remove from heat. Pour your meat mixture into your prepared 9″x13″ baking dish. Once your potatoes and turnips are cooked – they should pierce easily with a knife once they are done – then drain. Put pack into the pot and mash, or process them in your food mill. Add butter, stir to combine, then add eggs. Stir quickly. Taste, adjusting seasonings to your taste. Dollop the potato mixture over the meat. Spread to coat the pan evenly, ensuring your potato mix reaches the edges whenever possible. Drag a fork over the topping. Bake for about 25 minutes, until golden and the meat bubbles around the sides. Serve with salad, red wine, and country bread. < Previous Slow-cooker cabbage rolls. Darn…I just finished the last of my half-a-lamb and it was the best, delicate tasting lamb I’ve ever eaten. Could have used this recipe with it. Did you like the rutabaga potato mix. I’ve never tried it before. You are so right about the food mill. Had mine for about 15 years and before I got it I used my potato ricer. Mmm, I love good lamb! The rutabaga-potato mix was excellent – a little sweet and more flavourful than potatoes alone. 1. Love the new design of the blog. 2. May I please come over for this delicious meat that you hunted and gathered yourself?! Amazing!! 2. Absolutely 🙂 Bring dessert? Sounds like a plan! I’m there Dec. 21 – Jan. 6, so if we can make something work after Christmas that’d be amazing!